Hey mountain bike fans, this one is for you. Recently, singletracks.com added a pro feature to their website and because they are good friends of ours, we wanted to share the news and give away a couple memberships. What exactly does the pro membership give you? Well, access to the world’s largest mountain bike trail map directory….including US topo, USGS scanned, Open Cycle, Satellite topo, and USGS topo. Almost 6,000 topo maps. There’s a whole lot more that it offers, and you can find all the details at: http://www.singletracks.com/pro.php. 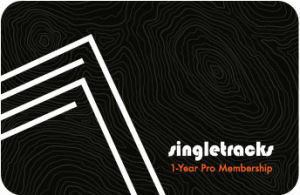 The cost of a Singletracks Pro Membership is $24.99 per year with discounts offered on a 2-year membership. Considering one single topo printed map is at least $12, it’s a great deal if you’re into trail riding. There’s also a way for you to earn points towards getting a free membership, so check their website for details. Thanks to everyone who entered. We’ve e-mailed the winners with details on how to claim the membership. But we’d love to give away a few free memberships to our readers who are into mountain bike trail riding. Enter by leaving a comment explaining why you’d like to go Singletracks Pro. We’ll give out 3 memberships and announce winners next week. Benny es justo en la bola. I love exploring new trails. Being directionally-challenged, however, leads me to forks where I am stopped, scratching my head, wondering which way to go. I would love to have access to good maps to find my way to trouble-free rides. Exploring a city’s trails is a great way to learn about the town. Singletracks had some of the best info on my last trip and led us to a some fun riding. With some big adventuress planned, having that kind of informations at hand is critical. looking forward to some new singletrack, that isn’t greedy in a bad way is it? We’re going to be traveling this summer, and I’d like to hit some of the trails along the way.